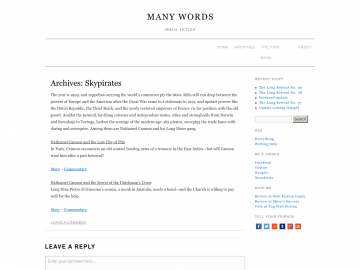 Muse's Success » Web Fiction Listings » Skypirates! "Tales of adventure, exploration, dastardly pirates, and zeppelins"
The year is 1929, and zeppelins carrying the world’s trade ply the skies. Rifts still run deep between the powers of Europe and the Americas after the Great War came to a stalemate in 1921, and upstart powers like the Dutch Republic, the Third Reich, and the newly restored emperors of France vie for position with the old guard. Amidst the turmoil, far-flung colonies and independent states, cities and strongholds from Darwin and Soerabaja to Tortuga, harbor the scourge of the modern age: sky pirates, sweeping the trade lanes with daring and enterprise. Among them are Nathaniel Cannon and his Long Nines gang. Skypirates! has not been tagged yet. Help others find Skypirates! by tagging it! Skypirates! has not been reviewed yet. Skypirates! has not been recommended yet.